According to the reliable source known as “the Internet”, Friday 8 February is National Kite Flying day. Whether or not this is a legitimate national day, we thought it was the prefect opportunity to highlight some brilliant kite flying parks in Randwick City Council. Flying a kite is a great way to enjoy the great outdoors, while fitting in some healthy activity for everyone in the family. Apologies for not being able to help with the first two, but for the third one, we’ve got you covered. Below are some of our greatest, flattest, kite flying spaces. Enjoy! Open, flat and tree-less, this sporting reserve is a great spot for running with a kite, as long as there are no spots being played or practice. The great thing about Neptune Park is that you'll often find you have it to yourself. So the chance of running into someone with your kite are slim to none. Plus, you’ve got the beautiful ocean as your back drop. Just south of Waverley Cemetery, Bundock Park is located at the northern tip of Clovelly Beach. It also contains a sports field, so you’ll need to avoid any organised sports taking place on the field. Other than that, the flat field is bound to pick up the coastal winds to help your kite soar. Located within the Prince Henry Precinct in Little By, this oval is idea for flying small kites, kicking a ball around or having a picnic. There’s also a playground for toddlers. Environment Park is a large are of bushland, parkland and wetland located in Randwick. There’s a large open space perfect for kite flying that’s surrounded by a cycle track. Nearby wetlands and walking trails mean you can explore for frogs, birds and lizards. 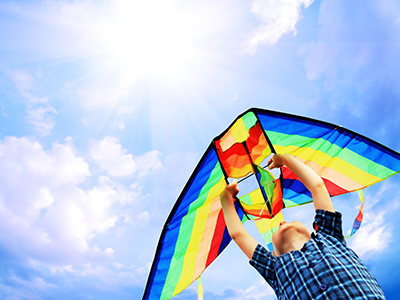 Located just behind the beach at Maroubra, this reserve is the perfect place to fly a kite. Plus, with other fun nearby, there’s plenty to do – stop in at the playground or the skate park for a play.